We are delighted to announce that the Poncho Project has almost become self-funding for the winter season 2018-19. 1132 ponchos have been sent to Calais since last summer, with more ready to go, but a combination of donations and strong sales of Ponchos4All has meant almost all the costs have been met. 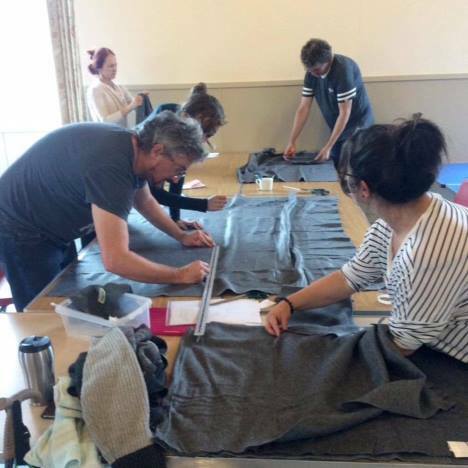 We would like to thank the many many volunteers in Cambridge that have made this possible, as well as Friends of Refugees Suffolk and St Albans for Refugees, both of whom organised poncho sewing in the autumn, and our friends from Norwich who have sewed ponchos and been on CamCRAG convoys to see how donations our distributed. The poncho project continues to expand: You can buy your own poncho from Ponchos4All online, including a new children’s poncho. Dates have now been announced for poncho sessions until September – you can find these on the CamCRAG events page and the poncho project’s website.